There are a lot of Weight Watchers snack bars recipe out there but since summer days are fast-approaching (not fast enough for some of us!, we’ve decided to make some easy Key Lime Bars. This dessert is one of our favorites because the taste of lemon is always refreshing no matter the season. Dessert lightened up is always tasty. We love to serve these snack bars at small parties because they are so easy to make, but impressive to serve. We’re a huge fan of portable desserts, especially during warm sunny days with summer picnics in full force. Add in a Weight Watchers meal recipe with one of our favorites: Chicken Pot Pie, Weight Watchers Mac And Cheese, or Weight Watchers Easy Cheese Lasagna. Something about the flavor of citrus reminds us of sunny days and warm ocean breezes because of its refreshing bright flavor and smooth, light texture. We can serve them with whipped cream, a light icing or straight up. Satisfy your key-lime craving with this Weight Watchers Dessert option. 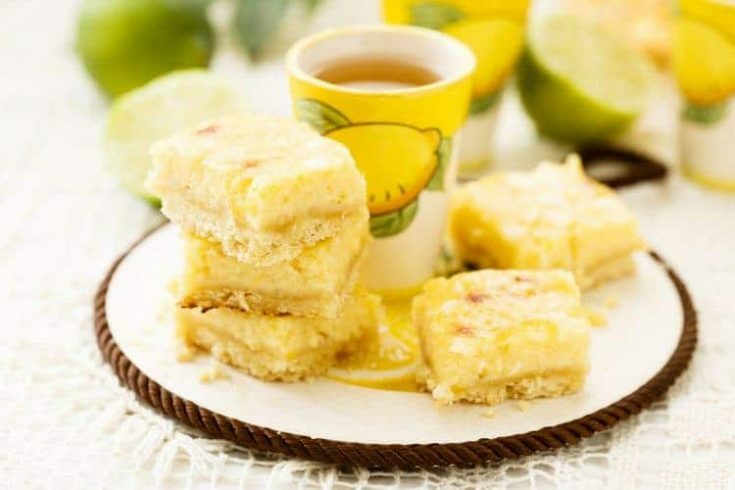 These delicious oh-so-zesty key lime bars doesn’t even taste even like diet food. They are cooling, tasty and have fewer calories than other Key Lime contenders. There are so many reasons to enjoy a couple bites of this yummy dessert without feeling any of the guilt. Indulge a little. You deserve it! 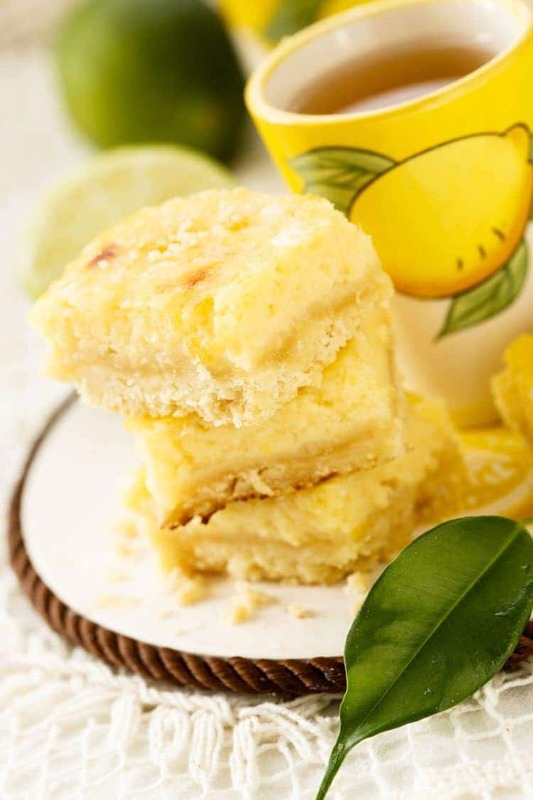 We have found the perfect key lime bars recipe that will still keep you on track with a Weight Watchers diet plan while satisfying your dessert craving. 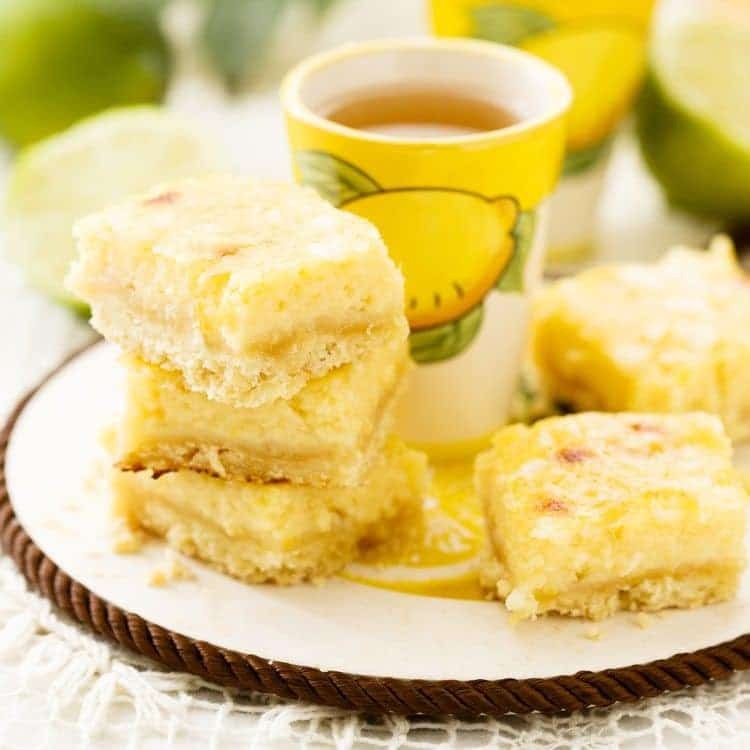 Enjoy this lower fat lime bars recipe that will keep you on track with a Weight Watchers diet plan. Preheat oven to 350ºF. Coat an 8-inch square baking dish with cooking spray. To make the crust, beat margarine, cream cheese and 1/2 cup of sugar with an electric mixer until light and fluffy. Beat in egg yolk and gradually add 3/4 cup of flour. Spread into baking dish using your hands (coat hands with 1 tablespoon of powdered sugar to prevent batter from sticking - or I stick my hand inside a plastic sandwich bag). Bake until crust is lightly browned, about 15 minutes. To make the filling, beat egg and egg substitute in the same bowl used to make crust. Add remaining 1 cup of sugar and 2 tablespoons of flour; beat on low speed until blended. Add lime juice; beat on low speed until blended. Pour onto warm crust and bake 15 minutes more. Cool on a rack. Sprinkle with 2 tablespoons powdered sugar.